Feature & promote your music on Facebook! Add buy buttons for iTunes & More! Upload your pics, bio & albums! Display your gig schedule and events. Build a mailing list with our email signup box. Learn how to sell music on iTunes. Receive and moderate comments on your tracks. Want to know how to sell your music on iTunes? 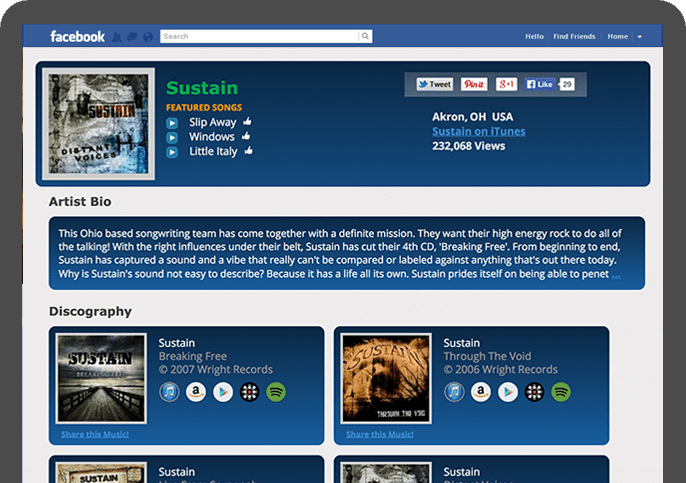 SongCast makes it easy to promote your music through Music Page for Facebook with artist and band bios and a calendar of upcoming events. Your fans will be able to purchase and listen to your songs from Music Page, with links leading to major music services. If you are looking to learn how to sell your music on iTunes, Music Page for Facebook will be a great addition to your fan outreach. Once you know how to sell music on iTunes, you can really start rolling.